This fun read takes on some serious issues but never forgets that it is a romance at heart. Clarissa Kirchendorfer wins Best Overall Rider of the Year, and five minutes later, via a text argument, realizes she’s bisexual. Such is teenage life when change and understanding come fast, hard, and without warning. But Clarissa has so much more ahead of her—the mortgage crisis, a foreclosed house, parents in denial, an older sister with Down syndrome who dreams of becoming prom queen, a past with Slobberin’ Robert, and an antagonistic relationship with the only out lesbian in school. The other narrator in this story is Lexie, an outspoken activist trying desperately to make up for the destruction her corporate parents have created by virtue of their professions. In the midst of falling in love, these teens find themselves trying to battle a foreclosure and better understand what it means to love. Nora Olsen gives her teenage couple a litany of problems, from the treatment of people with disabilities to the mortgage crisis. To Olsen’s credit, the issues rarely sound preachy; instead, readers are reminded of how very little is under the control of teenagers. A house can be lost, a sister taunted, a horse sold, and all without recourse. That helplessness is at the center of this story. A prologue and an epilogue bookend the story, setting readers up for the dual-narrator approach. While the two start out with a bristling dislike, it very quickly turns to love—perhaps too quickly. Neither character gets the benefit of much depth. Clarissa remains largely defined by her problems rather than her personality, and there is something of the stereotypical about the defiant lesbian activist in Lexie. Occasionally, Olsen gets a bit overzealous, putting huge chunks of information about the mortgage crisis into dialogue, thereby leaving behind verisimilitude in favor of a political stand. While Clarissa does a grand job putting the smackdown on the use of the word “retarded,” the moment still feels a bit staged, as does the discussion of biphobia. On the other hand, Clarissa’s elder sister, Desi, does not become an after-school special, though she is a woman with Down syndrome. Similarly, while this is the story of a lesbian and a bisexual woman in love, their sexuality is not the whole story. Readers will welcome this more rounded view of young love. 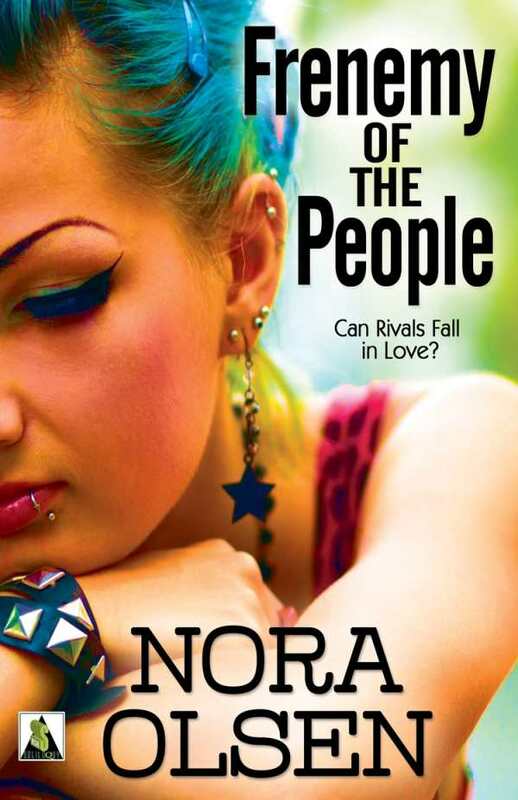 For young people looking to find themselves and their friends represented in books, Frenemy of the People comes as a relief, a safe space to see what love might look like.